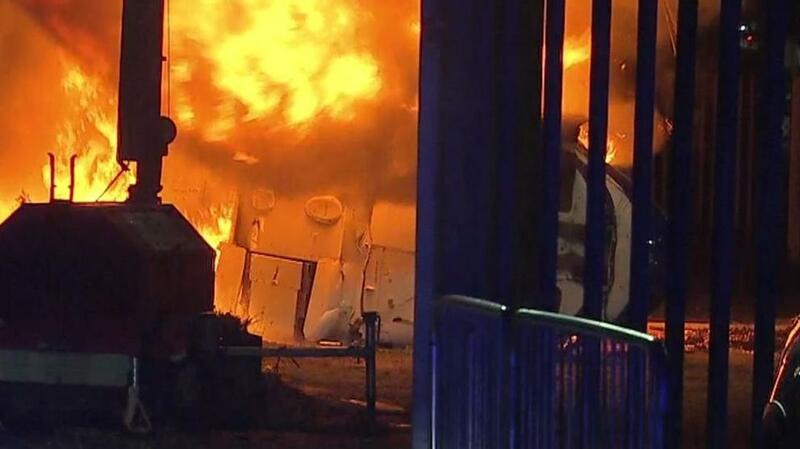 The owner's helicopter of Leicester Stadium in the UK has crashed in a fireball shortly after taking off from the stadium itself. Photos from the crash show a giant fireball near the edge of the stadium's parking lot. A witness said the helicopter took off from the pitch at about 8:30 p.m. but began to spin out of control within seconds and crashed into car park E. The car park is where staff park and is about 200 yards from the stadium itself. Rob Dorsett of Sky Sports News said, "At about 8:30 this evening, eyewitnesses told me they saw the Leicester City owners' helicopter take off from the pitch inside the King Power Stadium - as it does after every home game - and after a few seconds it appeared to lose control." "It sounds as if there was a problem with the rear tail propeller which sent it spinning out of control and it crashed into the car park at the rear of the King Power Stadium, just a few hundred meters away from where the pitch is before it burst into flames." After a home game concludes at the stadium, about 20 VIP guests are shuttled off in the owner's helicopter to a club also owned by the Thai billionaire, Vichai Srivaddhanaprabha. The helicopter took off more than an hour after the game concluded which started at 5:30 p.m. local time. Leicester City drew 1-1 with West Ham. The majority of attendees had left already but those who were still lingering were seen running as the aircraft came spiraling down. Local police reported, "We are dealing with an incident in the vicinity of the King Power Stadium. Emergency services are aware and dealing." East Midlands Ambulance confirmed responding to the scene but there is no word about the condition of the passengers aboard the helicopter. Early images paint a grim picture and low odds of survivors. One Leicester City fan named John Butcher said, "We were facing the ground from the bar across the road, I was with my nephew, we saw the helicopter spinning and it crashed within seconds then burst into flames. My nephew was in a real state of shock, he was so upset. Our hearts go out to whoever was onboard. The Srivaddhanaprabha family means everything to Leicester, they made us champions, you can't ask for more from owners - they won the league for us." Members of the home team including Leicester's star striker Jamie Vardy and former Leicester star Gary Lineker tweeted in support of the victims.